We don’t know why high school student Albert A. Benavides of 1139 East 55th Street was saving car fare by clinging to the outside of the rail car rather than buying a ticket. Maybe he had a date and wanted to buy her a cream soda, or was obsessively collecting pulp magazines, or simply couldn’t afford the fare. What we do know is that at Santa Barbara Street and Vermont Avenue, his skull connected with a telephone pole and he fell beneath the car, where his legs were neatly severed. It was a horror for the passengers, one of whom leapt from the window and extricated the youth. Taken to Georgia Street Receiving Hospital, his smashed limbs were amputated. They think he’ll live. Let us now turn our attention to the male weaverbird, who craft intricate nests to attract a female by stitching and knotting grasses together. Less industrious and ethical is our friend, the starling, who will sometimes steal the nest of another bird for mating. And then, there’s one Fred W. Von Falkenstein, an insurance broker formerly of Butte, Montana, who put the starlings to shame by stealing over $60,000 worth of home furnishings for his Alhambra love nest. Von Falkenstein was betrothed to a Miss Anne Marshall, also of Butte, who was soon to come to Alhambra so they could be wed. However, it was not to be. Von Falkenstein was apprehended after he came to have a peek at 223 S. McCadden Place, a home that had recently gone on the market. There, he met real estate salesman H.H. Morgan, who did not get Fred’s name, but found him suspicious enough to jot down his license plate number as he drove away. When the house was later burgled, Morgan handed the number over to police who confiscated between 6 and 8 carloads of stolen goods from Von Falkenstein’s home at 619 Meridian Avenue. Found among the items were Oriental rugs, solid silver home accessories, a radio cabinet, and a French salon painting valued at approximately $5000 that he’d lifted from the art gallery at the Ambassador Hotel. 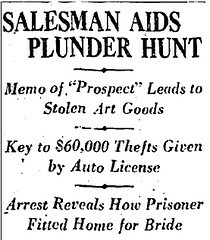 Though Von Falkenstein worked with an accomplice, Robert Donaldson of 1928 Crenshaw, he acted alone in the art theft and said it was easy. He simply walked into the empty gallery, cut the canvas out of its frame, rolled it up, and walked out of the Ambassador without drawing any attention. In addition to the art theft, Von Falkenstein also pled guilty to two more home burglaries, and was sentenced to 2 terms of 1 to 15 years at San Quentin. And so it was that our love bird turned jailbird. “A huge bowl of punch made from high-proof bootleg whisky” stood at the center of a drunken brawl that left one man near death and another on the lam early this morning. When an employee of the automobile wrecking plant located at 10636 Hawthorne Boulevard arrived for work around 8:00 a.m. today, he found Inglewood real estate developer H.C. Mitchell lying in a pool of blood at the back of the garage. Though badly wounded, Mitchell identified plant owner A.H. Van der Mark as his assailant. Officers have yet to verify that Mitchell, who remains in critical condition at Milton Hospital with gunshot wounds to his right lung and leg, is a former official of the Ku Klux Klan. Meanwhile, Van der Mark has disappeared. Eyewitnesses told different stories, but all agree the shooting occurred after a long night of heavy drinking at Van der Mark’s home (also the site of the wrecking plant). Mr. and Mrs. Charles Proctor told police the party was in full swing when they arrived, with guests freely partaking of the whisky punch. By 3:00 a.m., only the couple, Mitchell, Van der Mark, and Grace Haynes (a widow and the “asserted sweetheart of Van der Mark”) remained. Everything was rosy until Van der Mark allegedly told Mitchell that the latter’s habit of reporting bootleggers to the authorities “would make no difference in their regard for each other.” Apparently these were fighting words, for a scuffle began shortly thereafter. The combatants were separated, but Van der Mark returned with a .22 caliber rifle. The fight recommenced, three shots rang out, Mitchell fell to the kitchen floor, and the Proctors skedaddled. Police believe Mitchell then walked from the kitchen to where he was found in wrecking plant. Neither of the Proctors was held after making their statements. Grace Haynes, on the other hand, is being held in County Hospital as a material witness. She claims the severe bruising about her head and body was caused by Mitchell, who she says arrived at the party looking for trouble. He had several fistfights with partygoers smaller than himself, including Van der Mark, who wound up knocked out—and presumably unable to avenge his lady’s honor. Haynes’s brother (he wasn’t there, but the Times was happy to interview him anyway) says his sister told him Van der Mark was passed out, not knocked out, but either way, “He was cold when Mitchell pitched into another member of the party and this man got a rifle and shot him.” And who was this man with the rifle? Why, none other than Mr. Charles Proctor. Haynes also told her brother that while everybody else at the party was more or less blotto, she herself was completely—totally!—sober. To recap, of the five people present at the end of last night’s wild party, three claim Van der Mark shot Mitchell, one claims Proctor did the deed, and the fifth hasn’t been seen since the incident occurred. When two amateur fighters faced each other in the boxing ring at the Cudahy Athletic Club in Bell, each expected to emerge victorious…they could never have imagined that one of them would die. 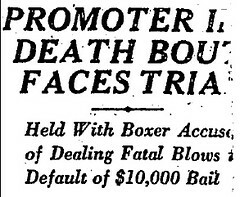 The young pugilists had been promised two dollars apiece by fight promoter and referee, A. De Weese. Harold Williams, seventeen, of 580 Wilcox Avenue, Bell, was upright for barely two minutes before he was knocked to the canvas three consecutive times by James Campbell, nineteen, of 4549 East Sixth Street, Los Angeles. Harold died of a brain hemorrhage at the scene. At the coroner’s inquest Harold’s brother Loren who had witnessed the fight, stated that Harold was given a “long count” (longer than ten seconds) by referee De Weese and so was allowed to continue fighting when he should have been counted out. De Weese and Campbell were arrested for manslaughter and each held on $10,000 (119,712.07 USD 2007 dollars) bail. Charges against them would be dismissed when Municipal Judge Baird ruled that there had been no violation of the California Penal Code. Harold’s may be one of the saddest long counts, but the most famous long count in boxing history is still five days in the future. The much anticipated rematch between defending heavyweight champion Gene Tunney, the “Fighting Marine”, and former champion Jack Dempsey, the “Manassa Mauler”, will be held at Solider Field in Chicago on September 26, 1927. Tunney will dominate for the first six rounds, but during the seventh round he will find himself in a corner being pummeled by a savage combination of punches that will drive him to the floor. Referee Dave Barry ordered Dempsey to return to a neutral corner, but the former champ ignored him for approximately nine seconds. Those few seconds would prove crucial. According to the rules the referee was not allowed to begin the count until Dempsey had returned to a neutral corner. It is very likely that Dempsey’s delay cost him the championship. Tunney had thirteen to sixteen seconds to recover during the long count. 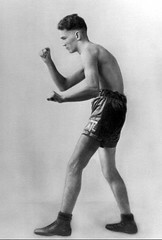 Tunney dropped Dempsey briefly during the eighth round – he retained his title and retired undefeated. 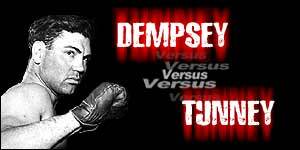 Dempsey retired after his bout with Tunney and opened a restaurant in New York City. Jerome Shaffer, 35, may have been the first case of suicide by car ever reported in California. A resident of Laguna Beach and professional entertainer, Shaffer had been ill and in financial difficulties when he drove his car to Laguna Beach Grammar School to end his life. Jerome parked his car on the playground of the school and crawled underneath leaving the engine running. He then wrapped himself in a blanket and held one end of a rubber hose in the self-made shroud with him, and thrust the other end into the car’s exhaust pipe so that the deadly gas would propel him into oblivion. His body was found by the school principal, George K. Bingham. According to his roommate, Jack West, Jerome had slipped quietly from their shared dwelling sometime during the pre-dawn hours of the morning. Shaffer and West had performed at the Masonic Hall in South Pasadena and returned home at 1 am. Jack told police that he hadn’t heard Jerome leave and only learned of his roommate’s fate when he found the letter which had been left for him. Shaffer also left a letter addressed to Judge Raymond Thompson of Pasadena. In that letter he gave instructions for the disposition of his automobile and said that he regretted that he had no money to bequeath West. He asked that his body be cremated by the Charles Lamb Company of Pasadena, and requested that his ashes be given a public funeral in the Laguna Beach open air theater. His final wish was that his remains be scattered over the Pacific by his longtime friend and pilot, Joe Skidmore. When members of the Long Beach vice squad got wind of a dice game going on in a pool hall at 1240 California Avenue, they swooped down on the place with tear gas. They hurled a few gas bombs into the building, and then watched as the pool hall belched forth men of color from every door and window as they fled the noxious cloud of gas. The vice squad thought that employing modern weapons such as those previously used in battle, would be an efficient way to combat criminals. Heck, tear gas worked on the Hun. Alas, gas bombs may be fine for driving a barricaded gangster out of his hidey-hole, but they are not the best weapon for busting a dice game. It took a very long time for the pool hall to clear of the blinding fumes. When cops were finally able to enter the room they discovered dice and money on the table, but the tear gas had destroyed all evidence of guilt on the part of the suspected gamblers. The police had several shady characters lined up outside of the reeking building, but with no way of proving their guilt they were released. The only person to roll snake eyes was the establishment’s proprietress, Edith Gilmore. There were still “galloping cubes” and money on the table, and this was sufficient enough for Judge Cook to fine her $5 and give her a suspended sentence of ten days in jail for permitting gambling in her place of business. The ballroom of the Biltmore Hotel is being readied for the annual Southern California Dahlia Society exhibition, which is last year drew 7000 people. There’s just something about the Biltmore that attracts Dahlias, and Dahlia lovers. In Nice, France, San Francisco girl Isadora Duncan — that free spirit danseuse whose corsetless physique and offbeat theories of health, movement and social mores made her at once the darling and the shame of thousands — perished in a grisly accident when her long scarf became entangled in the wheel of an open automobile. Duncan was pulled into the road, and died instantly of a broken neck. She was 50. The fateful scarf was a gift of Mary Desti, Duncan’s dear friend and the mother of director Preston Sturges, who would go on to invent many a fascinating, madcap female in his motion pictures. In Medford, Mass., Elizabeth Short, who will be remembered as the Dahlia of the Biltmore long after the flower show is forgotten, is three. "No longer will food be bolted at the table. No longer will the rooms and corridors resemble the interior of a Turkish bath with young men in various states of undress. No longer will the strains of ‘Columbo,’ ‘Lulu,’ and ‘Trojan Razz Song’ blare out from the dinner table." That’s right, the boys of USC are getting civilizing influence, whether they like it or not. Today USC President Rufus B. Von KleinSmid announced that each of the school’s 19 fraternities would be required to submit to the supervision of a house mother. This had been a pet project of Von KleinSmid’s for over two years, but was staunchly opposed by fraternities and sororities alike. Josephine Campbell, president of the Panhellenic Council, explained the women’s opposition to house mothers saying, "I believe college men should be able to take care of themselves and house mothers would make them dependent, rather than making them stand on their own feet and run the frat houses as they have in the past." Because USC women aren’t about to step through the pansy ring for any momma’s boys. Surely, oh, surely there are some very happy mailmen in Glendale today: a consignment of waterlogged ladies stockings are hung to dry around the post office. 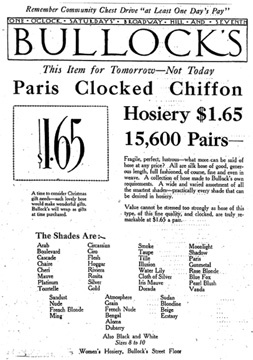 Whether they were similar to the Paris Clocked Chiffon Hosiery (in colors like French Blonde and Ecstasy) advertised by Bullock’s recently or simple utilitarian cotton, the Times does not say. Shipped by the Thieme Hosiery Company to a store in Crescent City near the Oregon border, the stockings were removed from the train and transferred to a “stage” for delivery to their final destination. Alas, though the thought of a macho Wild West wagon filled with ladies’ finery is a pleasing one, the stage was in fact an automobile. The driver probably would have faired better with a team of horses, for after a sudden cloudburst, he was forced to abandon both car and cargo in a flash-flooded stream. The stockings soaked in the creek for four days, after which the consignee returned them to the shipper. The Glendale post office notified the Thieme Hosiery Company, who refused to accept the soggy, but insured, package and declared they would collect the damages. Now everyone awaits the postal inspector. “It is expected that the affair will be straightened out after several reams have been covered with correspondence, at a large outlay of time and money,” sagely notes the Times.